As our clients come for a uniquely Scottish experience, Drumscot avoids international hotel chains, which offer the same blandness worldwide. Scotland has come on ‘leaps and bounds’ in the last few years in terms of hotel service and comfort. Reassuringly this improved quality has not come at the cost of the charm and character of older establishments. 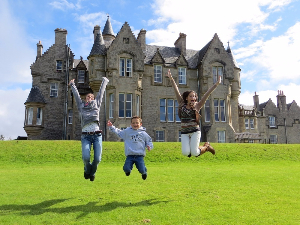 From hiring your very own castle to staying in a cheery friendly inn, Drumscot works with an exceptional array of hotels, which offer fine hospitality after a day exploring our delightful country. Rufflets Country House Hotel, St Andews – An award winning restaurant, spacious and tastefully decorated rooms and beautifully landscaped gardens make it well recommended. Kinloch Lodge, Isle of Skye - family home of Scotland’s renowned cook Lady Claire Macdonald. Their highly regarded restaurant celebrates Scottish cuisine made from the freshest, local produce. The Torridon Hotel, Highlands – Supreme Highland comfort and authentic right down to the peat tinted water. For sheer raw, wild and natural beauty this area of Scotland is hard to match. Boath House - An immaculately restored mansion, which is home to award winning Chef Charlie Lockley. Excellent Spa, beautiful bedrooms and fantastic grounds. Ideal for couples who appreciate fine food and drink. Glengorm Castle, Isle of Mull – Wake up each morning to breathtaking and dramatic scenery from your bedroom window and after a busy day exploring the beautiful sights of Mull, guests can enjoy a wee dram in front of one of the many log fires! 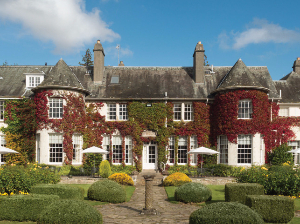 Fonab Castle, Perthshire – A castle refurbished sumptuously into a luxurious hotel on the banks of Loch Faskally and a short walk to the picturesque town of Pitlochry. The Howard Hotel, Edinburgh – An elegant establishment in the heart of Georgian Edinburgh. Your own personal butler will ensure that you experience a class of subtle yet dignified service that you deserve, in elegant and traditional finesse. 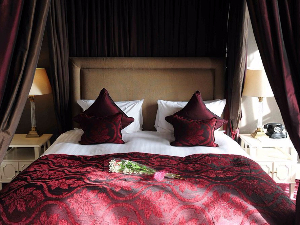 Hotel du Vin at One Devonshire Gardens, Glasgow – This exceptional luxury hotel consists of 4 connected Town Houses. It has long established itself as the city’s premier hotel. For those who enjoy gourmet food of the highest order the hotel’s is intimate and atmospheric oak panelled Bistro must be visited!